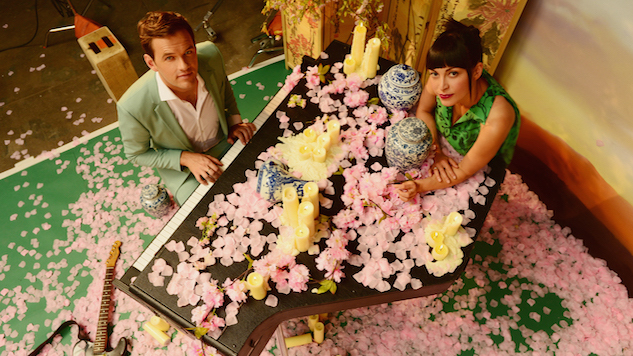 At the end of last month, Brooklyn-based St. Lucia announced they would be putting out their third full-length album, Hyperion. They commemorated the announcement by sharing the first single from the album “Walking Away,” which we highlighted as our Daily Dose upon its release. “Walking Away” is about the current state of paranoia and surveillance in society. It was written years ago and at the time I had no idea what it was about, but as time passed its meaning became more and more clear to me. I think Henry Kaplan did a really great job of tying the video in with this idea, where often it feels like you’re almost too close and up in the band’s’ personal space. It was shot in the middle of the NYC summer in a warehouse with no ventilation or A/C, so we were sweating our asses off so you can be thankful you’re not really up in our personal space. The song is a funky indie-pop track that is sure to get you dancing, and its accompanying video uses color to emphasize its infectious rhythm. Hear for yourself via the video below, and stick around for audio from the band’s 2012 Daytrotter Session. Hyperion was produced by Rob Kirwan and is out on Sept. 21 via Columbia Records.